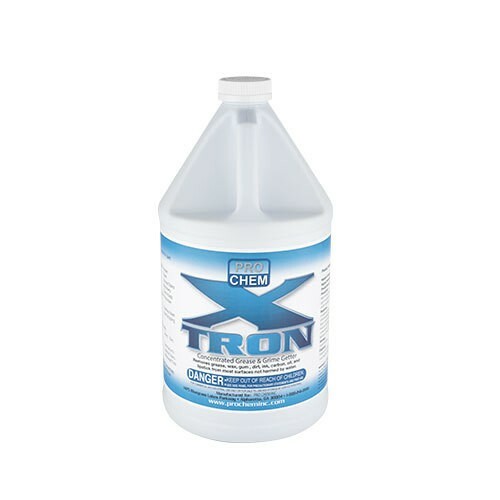 X-Tron | Pro Chem, Inc.
X-TRON is a highly-concentrated, biodegradable, water-based, butyl cleaner/degreaser with a refined surfactant system that not only penetrates and lifts the grease and dirt from the surface but emulsifies them as well. The multipurpose, heavy-duty cleaning action leaves surfaces clean and free of residue. It is also ideal for use on automatic scrubbers because of its low foaming ability. It can be used to clean any surface not harmed by water. For stripping: Mix 1 part concentrate with 8 parts water. Ideal for use in automatic scrubbers because of its low foaming qualities.